Vitamin D3 tablet supply natural vitamin D, and essential fat-soluble nutrient important for normal development of healthy teeth and bones. Vitamin D3 is crucial for proper mood, maintaining bones, joints, and muscle tone, cell growth, and support brain and nervous system. According to recent studies, Vitamin D3 may also have Diabetes and Cancer fighting properties. Other Ingredients: Cellulose, Croscarmellose Sodium Calcium Carbonate, Silica and Vegetable Stearate. Does Not Contain: Yeast, Wheat Gluten, Soy Protein, Milk/Dairy, Corn, Sugar, Starch, Artificial Coloring, Preservatives or Flavoring. 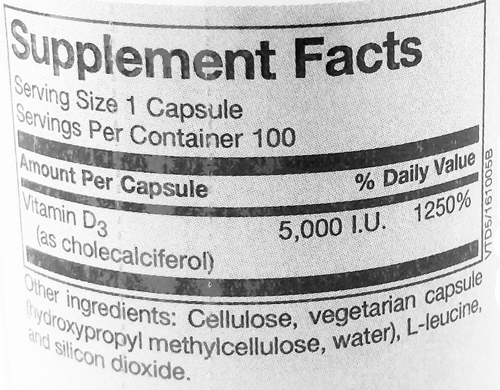 Suggested Use: As a dietary supplement, adults take 1 tablet daily or as directed by your healthcare professional. Warnings: People consuming more than 2,000 IU per day should have their vitamin D blood levels monitored by a healthcare professional. Keep out of reach of children.